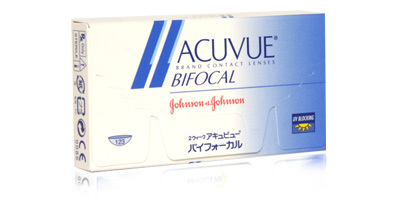 Featuring a revolutionary Pupil Intelligent Design system patented by Johnson & Johnson, Acuvue Bifocal contact lenses provide crisp vision up close and at distance. These two weekly disposable lenses offer those affected by presbyopia freedom from reading glasses and block 82% of UV-A and 97% of UV-B radiation. Sharp focus, all-day comfort and eye health benefits are combined in one sophisticated lens. Made from a soft polymer material that allows oxygen to permeate easily, Acuvue Bifocal lenses keep eyes moist and comfortable for over 12 hours a day. The Pupil Intelligent Design system was developed to give presbyopia sufferers a lens that provides outstanding visual acuity. The lens features five concentric zones that enable the wearer to see objects located up close and far away in bright and low-lit conditions. 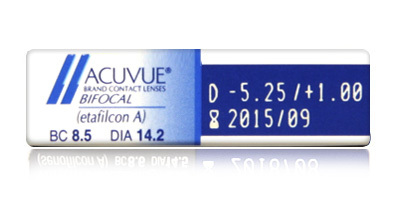 A light blue visibility tint makes Acuvue Bifocal contact lenses easy to see and handle. Application is simple, thanks to a handy 1-2-3 inside-out indicator. If the numbers appear in reverse order, the lens is inside-out. 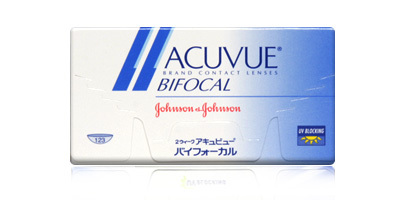 Each box contains six Acuvue Bifocal contact lenses. These bi-weekly lenses are available in powers from -9.00D to +6.00D. Wear them on a daily replacement schedule or on an extended wear basis for up to six nights. Check with your optician before trying extended wear. 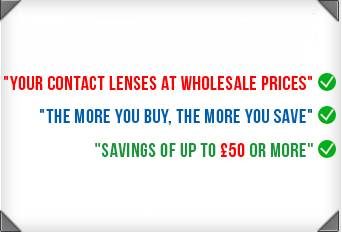 For more information and advice on these and all other products featured on ContactLensesExpress, call our dedicated team on freephone 0800 037 4000. 98% of our contact lens orders are sent out the same day. A number of delivery options are available, including express delivery.